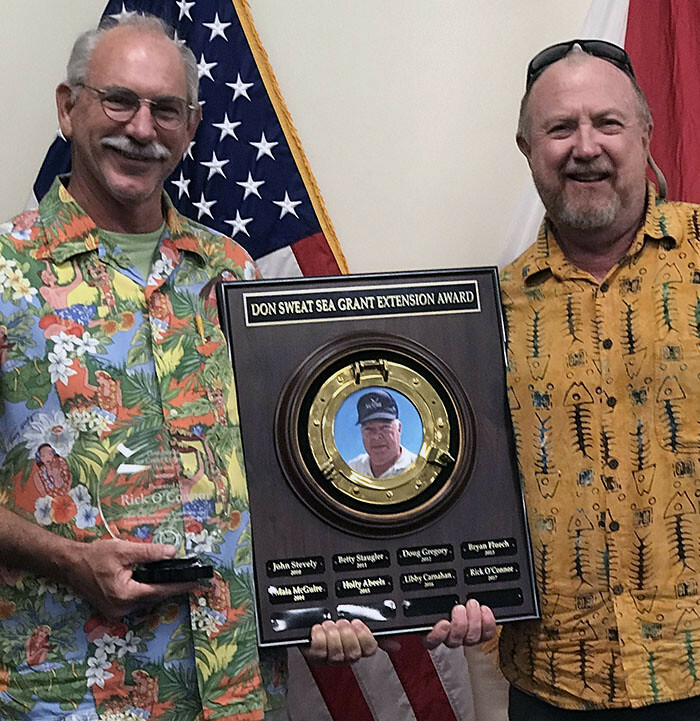 The award is presented annually to a Florida Sea Grant agent who takes initiative, creativity and leadership in his or her extension program. In his six years with UF/IFAS Extension, O’Connor has focused on improving coastal and marine literacy for adults and youth, removing invasive species from his county’s coastline, improving water quality and restoring impaired habitat. One of his most impactful programs focuses on reducing stormwater runoff and marine debris. The program includes a citizen science component in which high school students and adult volunteers monitor water quality in the area. Just last year, more than 1,200 county residents participated in the program, gaining a better understanding of local water quality issues and possible solutions. “Rick’s programs have addressed local issues and concerns and he has impressed local officials with his quick response, planned educational workshops and willingness to go the extra mile for clientele,” said Pam Allen, O’Connor’s former county extension director. O’Connor has also helped coordinate the county’s lionfish management plan, nearly eradicate invasive beach vitex from waterfront properties, and conduct a diamondback terrapin survey to promote conservation of the species. Prior to joining Florida Sea Grant, O’Connor taught high school and college-level marine and environmental science. From 1995 to 2012, he also developed and directed the Institute of Coastal and Marine Studies Program for the Escambia County School District.